Cat Tales and Paper Trails: The Ton's Summer 2017 Release Hop! The Ton's Summer 2017 Release Hop! 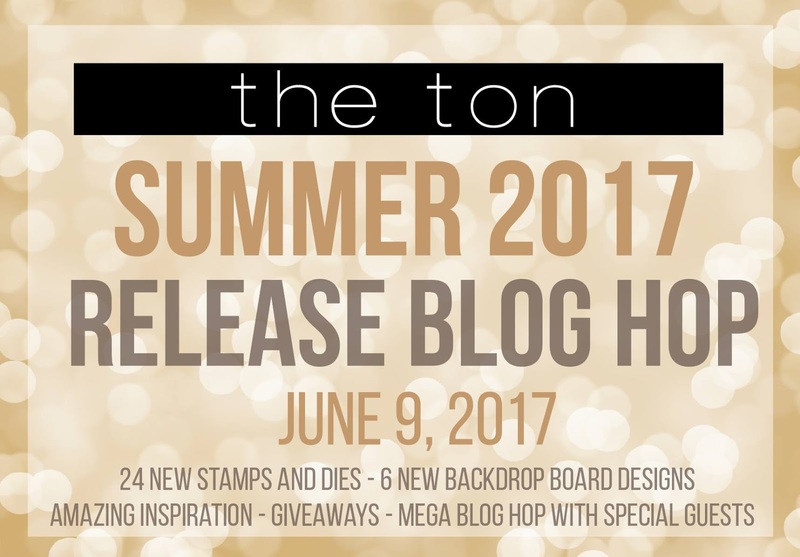 Hello, and welcome to The Ton Summer 2017 Release Blog Hop! 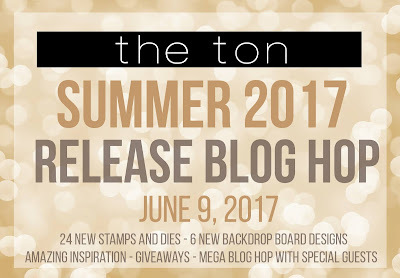 The Ton has 24 new stamps for their new Summer 2017 Release which includes up to four free gifts with purchases. For more information on The Ton’s incentive gifts, head over to The Ton's blog. All new release products are available now! 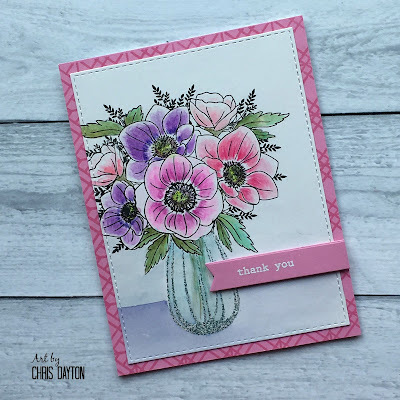 This card features the new stamp Anenome Bouquet. I masked off the stems of the bouquet, stamping only the flowers and greenery in Versafine ink onto watercolor paper. I then masked the lower portion of the bouquet and stamped the vase in Versamark ink and heat embossed it with Wow! Seaglass embossing powder. The image was first watercolored using Zig Clean Color Real Brush markers, then I added a bit more detail with Faber Castell Polychromos pencils. My colored panel was cut using one of the Double Stitched Rectangle Dies and added to a pink layering panel with I had stamped the Geometric Lattice Cling Background in Soft Garnet ink. The thank you sentiment strip was heat embossed in white and popped up from the card base with some foam tape. 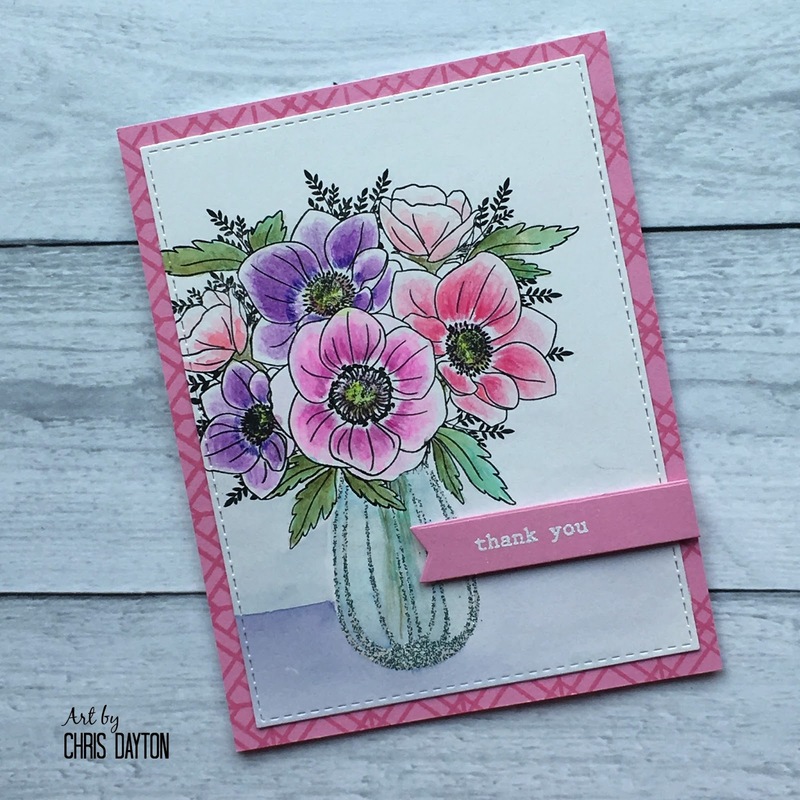 My next card uses one of the latest in the series of beautiful peonies from The Ton Stamps, Large Peony 5. 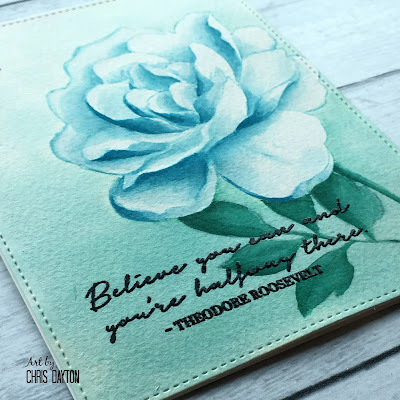 I absolutely love peonies, and these new stamps are must haves. They are gorgeous and so much fun to paint. I chose to paint with Distress Inks for this card. I stamped my image with the Distress Ink, softening and blurring the lines with water before adding more color and shading back in. When dry, I used the larges sized Double Stitched Rectangle Die to trim my panel. 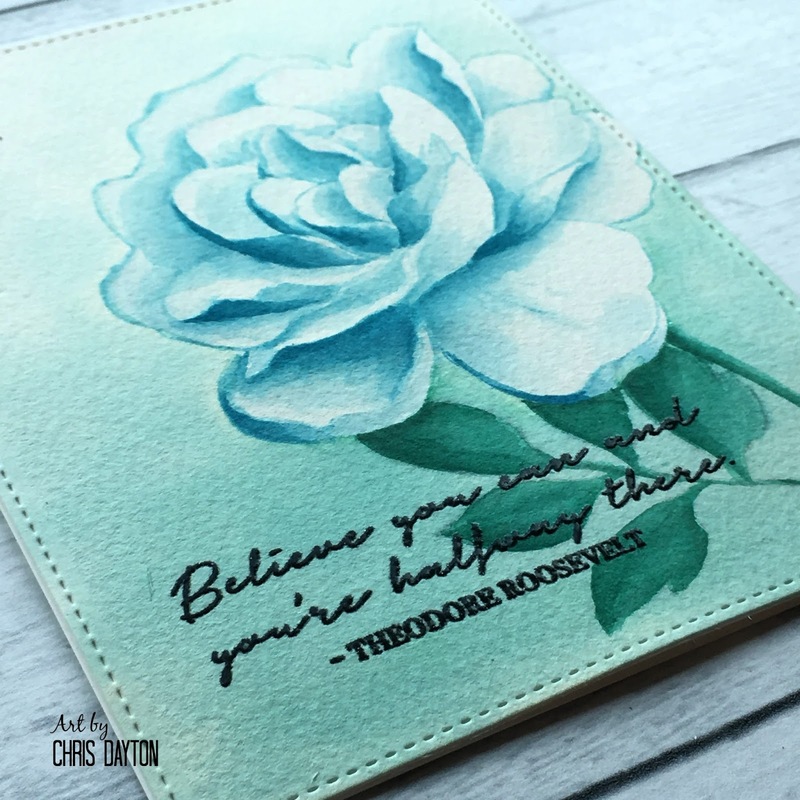 The gorgeous quote was added last with Caviar Hybrid ink and heat embossed with clear embossing powder. This graduation card is my favorite one I have made this year because it is so different and classy. This uses the set Sunnies. And these Tortoise-shell sunglasses are fabulous. I stamped them on in Warm Cocoa ink on ivory cardstock. I added just a bit of shading with Copic Markers to the tips of the bows and around the nose bridge. I also used cool gray Copics to color the lenses leaving a sliver of uncolored area as highlight. I used Nuvo Crystal Glaze to coat the entire image, and let it dry for 24 hours. I then coated just the lenses a second time, and let dry again. I created the background by masking off a 3/8' border around my ivory card base. I then used a sponge dauber to ink Warm Hazelnut ink to the left side. 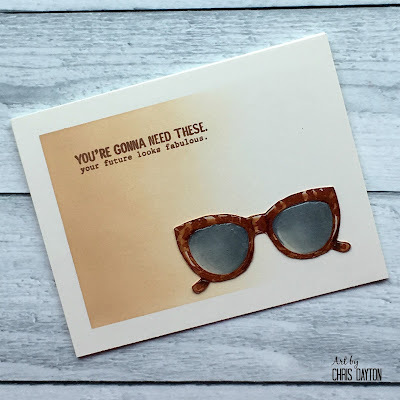 I added the sentiment from Sunnies in Aspen Cocoa ink. 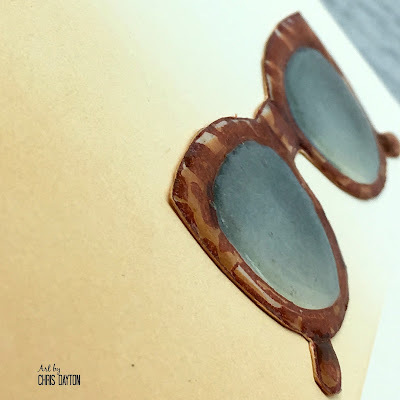 When my Sunglasses were fully dry, I carefully cut then out, and inked the edges with Warm Hazelnut ink, and adhered to my inked and stamped card base. Three $25 gift certificates to The Ton's shop will be given away to random commenters from the hop participant blogs. To qualify, you must also leave a comment on The Ton Blog Hop post. The comment period will close on Monday, June 12th at 11:59pm. Winners will be announced thereafter on The Ton’s blog. Beautiful cards. I love the new Sunnies set. It is so much fun! Oh my! Chris your cards are beautiful, you always color so beautifully and those sunglasses on what fun and they look so real! The sunglassesncard is so simple and so perfect. Wow! Those glasses are phenomenal. Great cards! Those Sunnies always make me smile, remind me of my mom! Gorgeous flower cards! Beautiful. I think only thing different I would do is put Glossy Accents on the vase to make it look like glass :-). Masterful designs and flawless execution. Love these! 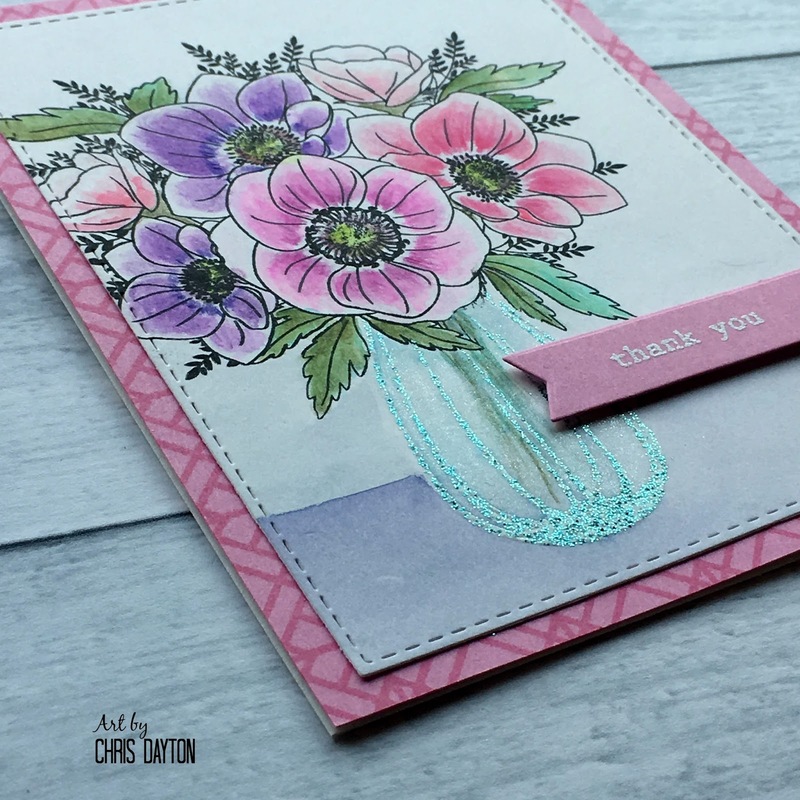 Beautiful cards, love the soft colors you used. The guest designers have done an incredible job of showcasing this release. Thanks for sharing. I LOVE that glass vase, your breathtaking monochromatic peony and those fun glasses! Oooh, that sea glass ep is gorgeous! Love that beautiful card. All of your cards are gorgeous. Great cards. I really like the vase on the first one. Those sunglasses look so real I just want to put them on - fabulous. Beautiful cards! Love the blue peony so pretty and soft. Great job. Love all three of these, Chris! They are amazing! Great cards. Sunglasses looks real! I just love your Peony card, simply stunning. Love the Sunnies and the tortoise effect. Love your cards!! I would love to see how you painted that peony is is beautiful!! All the cards are great, but those sunglasses look so realistic! I am really in love with the sunglasses stamp. So cute but elegant at the same time. Love your watercoloring. Thanks! Love the floral card. The way you heat embossed the vase is beautiful. What beautiful cards! Your no-line coloring is stunning and I love how you used the vase with the bouquet - just so pretty! Wow! I love the coloring you did -- makes these cards really stand out. Love all of these card designs, especially the third one with the glasses! Absolutely beautiful cards. Thanks for the inspiration. Gorgeous cards! Love the vase of anemone flowers! 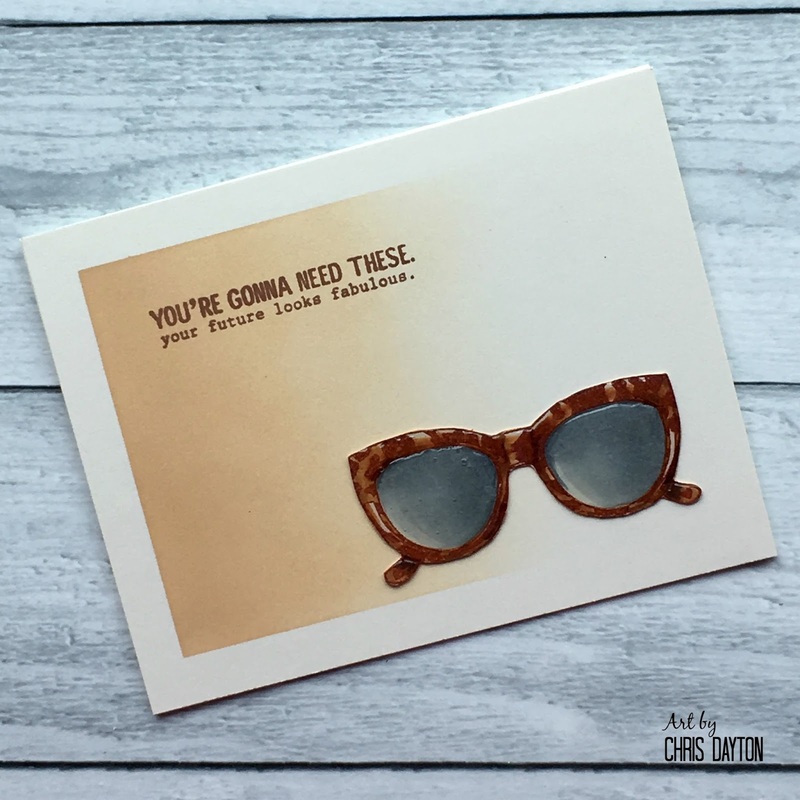 Fun card with the sunglasses! Awesome coloring! A beautiful trio of cards! My absolute favorite is the second one! Great color choices and beautiful coloring! TFS! Gosh, you've done such a phenomenal job on all three of your cards! I may have to CASE the sunglasses design! Wonderful job on these cards...love the use of glossy accents on the glasses to add that bit of interest. Great cards, Chris. Such a pretty vase of anemones, so delicate and beautifully done. Love the peony, it's gorgeous colored in soft blue hues. And your sunglasses look so realistic! your coloring is in a class of its own. Always blows my mind! your glasses look so real! Such beautiful cards! 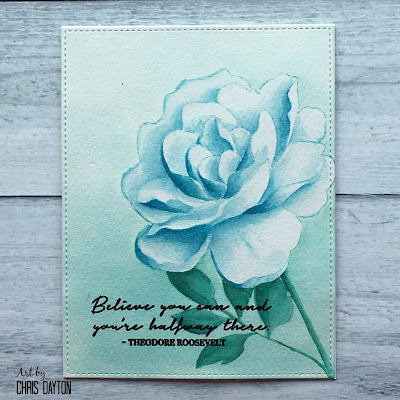 I love peonies as well and the way you painted this card, it looks like you could hang it on a wall! Gorgeous! I absolutely LOVE your cards! Thank you so much for sharing! Gorgeous cards, absolutely love that second one! Beautiful floral cards and those lenses are so awesome! Love them all! I love every one of these gorgeous creations! The grad card is perfect with that awesome sentiment. I need that set!! Love the shimmer on the vase and your no line coloring! Wow. Your coloring is amazing. Beautiful cards. I am new to your site and already LOVE your work! Great cards!